1 Daughters of the American Revolution Genealogical Research System, Ancestor #A100997. 2 Find A Grave, (accessed 04/10/2015). 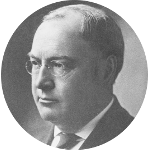 3 The National Cyclopaedia of American Biography, Volume 14, New York: James T. White and Company (1910), 406-407, Google Books (Digital Library). 4 Hatfield, Mark O., Vice Presidents of the United States, 1789-1993, Washington: U.S. Government Printing Office (1997), 325-332. 5 Roberts, Gary Boyd and William Addams Reitwiesner, American Ancestors and Cousins of The Princess of Wales, Baltimore: Genealogical Publishing Co., Inc. (1984), 64, Ancestry.com (Online Database). 6 Sherman, Roy V., Some of the Descendants of Philip Sherman, the First Secretary of Rhode Island, Akron, Ohio: Unknown (1968), 501, 563. 7 Stratton, Bertha L., Transatlantic Shermans, Staten Island, New York: Bertha L. Stratton (1969), 172, Internet Archive (Digital Library). 8 Talcott, S. V., Genealogical Notes of New York and New England Families, Vol. 1, Albany, New York: Weed, Parsons, and Company (1883), 707, Ancestry.com (Online Database). 9 Wikipedia, "Richard U. Sherman", (accessed 04/10/2015).